China is currently the number one exporter of the world with over 2 billion dollars’ worth of goods exported. Trade has thus been one of the pillars of China’s overall economic expansion. However, the impact of domestic consumption is often neglected. China’s economic success is actually largely dependent on domestic consumption and that is problematic. China is growing exponentially and they need to keep up with demand. In order to maintain their edge, China has been pouring a lot of money in growing their infrastructure. However, China’s economic growth was largely driven by debt. One of the prime metaphors for the Chinese economy are their famous ‘ghost cities’ . To keep people employed, so they can buy stuff and keep the wheels going so to speak, China chose to commission enormous cities. Problem is, nobody is living in them. The plan was to move people from rural areas to these cities when they were finished constructing, but it doesn’t seem to be the case that is happening any time soon. And now China is at a point where they accumulated so much debt in building housing, factories and infrastructure that local authorities can never repay it. Such a model is unsustainable, and so China is trying to come up with a new driver of growth besides domestic consumption to keep its edge. And so China is ramping up trade expansion, wants to position themselves higher in the supply chain and is looking at new technologies to profit from. The main goal of One Belt, One Road Initiative (OBOR) has always been to smooth economic integration and expand China’s trade capabilities. As I stated above China seems to have some trouble coming up with enough demand, one of the ways they deal with that is by looking outward. The OBOR project promotes mobility and economic cooperation between countries in Europe, Asia and Africa. OBOR will serve as an outlet for Chinese exports and a secure route for energy imports — both essential for the Chinese economy. OBOR would allow China to alleviate some of the pressure of the Chinese economy because of domestic troubles. If China somehow manages to increase their exports even more it would give the Chinese economy some well-needed breathing space and a way to pay off their accrued debts. We see in OBOR somewhat the same strategy happening as with the commission of the Chinese “ghost cities”. Chinese labour is being used to build infrastructure and keep people employed. Only much to China’s glee, it’s the other country paying for it now. This way China essentially found a way to keep ‘consumption’ afloat by looking at foreign demand. For example, we have seen Kazakhstan experiencing tremendous growth due China’s OBOR initiative. They have become the proverbial buckle in China’s belt and road initiative and will serve as the bridge between China and Europe. Kazakhstan will likely become the largest transit hub in Eurasia. While Kazakhstan is a major success in the OBOR-narrative, some are wary of China’s economic expansions and call it a “debt-trap”. In my opinion this isn’t necessarily the case and more of a matter of figuring out where supply meets demand and if both countries can keep the two balanced. Some OBOR-initiatives will inevitably fail as some countries will fail to find a way to keep demand afloat, while other will flourish and prosper. In any case, Kazakhstan’s unemployment levels have never been so low, and OBOR is to thank for that. The above was a prime example of how Kazakhstan (a land-locked nation) profited from one of three tangible aspects of the Belt and Road initiative, namely the building of physical infrastructure like roads, railways and power plants. It thus serves as a symbol of success for the “land” route of the OBOR initiative, the first aspect of OBOR. 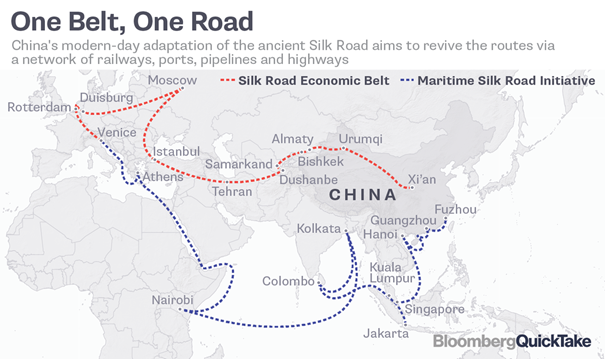 There is however also a “sea route” — dubbed as the “Maritime Silk Road”. We will ignore this for now and instead focus on the third, highly underreported aspect of OBOR: The Digital Silk Road. The Digital Silk Road — catalyst of a new digital revolution? In 2016, 30.3% of China’s GDP came from the Chinese digital economy. In 2017, Chinese e-commerce constituted 42% of the global market, with companies such as Alibaba and Tencent leading the way. Chinese tech firms has thus experienced massive growth in the last decade, this combined with significant political support allows China to become a beacon of innovation. For example, mobile payments are 11 times higher than in the US. A problem western tech face is they often are at odds with politicians over data-usage practices. Something China largely ignores and so they have a headstart when it comes to digital innovation. In fact, China’s 13th Five-Year Plan (2016–2020) calls for the development of promising technologies such as blockchain and artificial intelligence (AI) and also plans to strengthen research on the application of fintech, cloud computing and big data. The Chinese government even wants to build their own version of Silicon Valley in the province of Guiyang. In essence, the Chinese IT-sector is enjoying a lot of momentum in the contribution of a digital silk road. The enormous digital growth China went through unfortunately also meant that they are the country with the highest amount of fragmented data in the world. Efforts are made to link technological solutions to existing Belt and Road investments and better facilitate connectivity and logistics in several areas, such as E-commerce and customs automation, Telecommunications infrastructure and sustainable infrastructure. 4. China is actively building a Digital Free Trade Zone in the form of an Electronic world trade platform. Blockchain will likely play a role in that zone. Combined, this information tells us a couple of things. Namely that blockchain will not fail in China. There is much needed demand for it and the Chinese government is openly supportive of the technology. It is no surprise the People’s Bank of China (PBOC) is developing a CryptoYuan and I am personally very curious for what will happen once the pent-up demand from Chinese investors enter the cryptomarket. 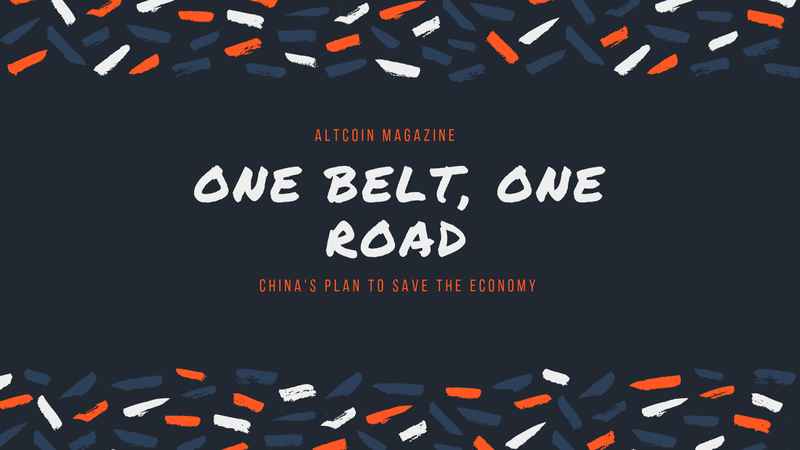 It also needs OBOR to succeed and with reports that China is actively experimenting with blockchain it is safe to say that those projects that are able to position themselves in the middle are ones worthy of our attention. If you liked what I wrote feel free to subscribe to my twitter as well where I will post the latest developments on Matrix AI Network. Feedback is always appreciated and remember to do your own research! The purpose of ALTCOIN MAGAZINE is to educate the world on crypto and to bring it to the hands and the minds of the masses. This article was written and composed by Steven Price on ALTCOIN MAGAZINE.